I sent my crystal ball out to fix a crack that I noticed after getting several Indianapolis City-County Council races wrong in November. (I would note I did correctly prognosticate that Democrats would win the mayor's office and control of the council.) Got it back today. I am behind on making predictions for 2016. Let me start with the race for the White House. This, of course, is subject to change as things develop in 2016. GOP Presidential Nomination: Expect Texas Senator Ted Cruz to win the Iowa caucuses. New York businessman Donald Trump will finish a distant second but win a week later in New Hampshire with Cruz finishing third behind New Jersey Chris Christie. It will be the only bright spot in Christie's campaign. Florida Senator Marco Rubio will displace him in the other states as the Establishment's favorite.. But the Establishment candidates will go on to lose every GOP primary and caucus in 2016. They will all drop out, leaving Cruz and Trump are left to slug it out in a state-by-state battle that goes into the Spring. Cruz emerges, riding a wave of populism and even the support of Establishment backers who find Trump unacceptable. Democratic Presidential Nomination: Bernie Sanders opens with a win in the Iowa caucus and a close second place finish in New Hampshire. While the media coverage of Sanders finally reaches Trump-like proportions, Sanders, without the staff or funding of Hillary Clinton, struggles to compete elsewhere. Sanders only reward for his popularity is a major speaking role at the convention. Presidential General Election: Cruz and Clinton receive their nominations despite having historic negatives. Those negatives are driven even higher as the two candidates take bitter shots at each other on the trail. But Cruz is able to take advantage of the populist angst in the country and successfully label Clinton as a creature of Washington and Wall Street. Cruz pulls out a close victory over the former Secretary of State. Let's see: a sitting senator with a Goldman Sachs wife successfully fools the country into thinking he's anti Washington and Wall Street? 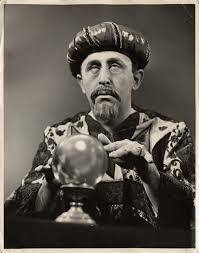 Paul, I believe your crystal ball is again in working order. I happen to agree with all you've conjectured in your post. If Sanders wins Iowa, Hillary's coronation is over. He wins NH in his backyard, and suddenly voters in other states stop thinking Hillary is the "most electable" candidate. You've really got a thing against Trump. I think that crack in your crystal ball just got bigger. Rubio will win the GOP nomination and Clinton will clean his clock in the general election. I have a thing against candidates who are very liberal Democrats, then virtually overnight changes their views 180 degrees pretending to be a conservative to get the Republican nomination. I have a thing against candidates who says they "very pro choice" and supports partial birth abortion. I have a thing against candidates who say they support affirmative action and continued funding of Planned Parenthood. I have a thing against candidates who want taxes raised and don't support free trade. I have a thing against candidates who supports the use of eminent domain to take away homes from little old ladies so they can have limousine parking for their casino. I have a thing against a "successful" businessmen candidates who four times welshes out on their financial commitments by filing for bankruptcy. I have a thing against candidates who push ridiculous policies that will cause my taxes to skyrocket. I have a thing against candidates who mock women based on their looks and men based on the size of their wallet. I have a thing against candidates who don't support religious freedom. I have a think against a faux conservative candidates who will throw away this wonderful chance we real conservatives have to win the White House and get a solid majority on the United States Supreme Court. You are right...I do have a thing against Donald Trump. Paul you and your opinions are meaningless. Just kill yourself. Mr. Ogden makes an excellent case @ 1:36 & I surprisingly find Trump compelling; having not agreed with him much at all in the past. My take on Trump's "conversion" is he knows what's at stake & he'll be held to his campaign positions if he gets that far with much of the former base... we'll see. I never discount Mr. Ogden's opinion. I think Paul's prognostication is accurate. If Sen. Rubio indeed loses both IA and NH, I'm unsure if he'll have the momentum (read: $) to keep going. I also agree that -- as much as the establishment hates Cruz -- it would prefer Cruz to Trump. The Scar continues to under or half source; a sin of ommission. Why don't they have any quote from Professor Hill, a Constitutional Law Professor working at the same Law School? • Hillary will not be indicted. She will be the Democratic presidential candidate. • Trump will not be the GOP presidential candidate. • The GOP grass roots will stay home and not vote. • By 2020-24, our country may will look like the 1850s antebellum period. Cruz, the anointed one, wins. Founding fathers declare experiment over.